FALCON is a European research project that aims to develop a framework for the realization of new products and value-adding services, based on user experience as well as product and related services usage, in accordance to the principles of sustainability and social responsibility. In the FALCON vision, customers will no longer play a merely passive role in product and service development processes as they will express their experiences and opinions with products and services through social media. In addition, information devices embedded into products along with developments in the eld of the Internet of Things (IoT), will be leveraged to extract actual product-service usage data. This potentially limitless amount of information offers a rich ground for value creation in the product-service innovation chain. FALCON will investigate how user experiences and usage data collected via IoT and social media can be deployed for the improvement and design of product-services. To address product-service information collection through Collaborative Intelligence and Product Embedded Information Devices. To enable product-service knowledge representation, exploitation, openness and diffusion. To strengthen new, collaborative product-service development processes through new feedback and feedforward mechanisms. To support innovative product-service design using manufacturing intelligence. 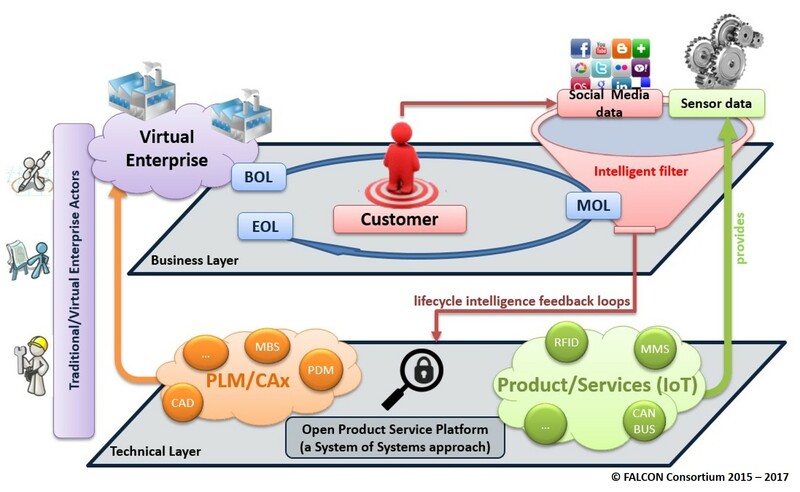 To improve product-service lifecycle assessment approaches.